A man on horseback rides against a windstorm; he is on a white stallion and clad in armor. His cape blows up and his horse stretches for speed. The wind is blowing trees and clouds with great force right at him, but his only response to this opposition is to raise a sword even higher as he charges on. Knights are the Tarot’s way to deliver something. Swords represent ideas, words and thoughts. When the Knight delivers his words to you, the idea behind what is being said becomes apparent quite rapidly. The white horse indicates that the message being delivered is pure. There is no intent to harm with these thoughts and words, but the person speaking them may not be aware of how they sound or the disruption they cause to the daily routine. Someone who is sensitive about his or her belief system will feel trampled by the Knight’s horse when challenges to these core beliefs are expressed. Are you avoiding the cold reality of a situation? Were you too blunt with someone who needed to be told some news in a more gingerly fashion? Is it past time for some plain talk between you and a lover? Were you so insulated from criticism that you developed a thin skin and are now having it pinched at the most casual comments from friends and strangers alike? Have you been dealing with a boss who seems to assign jobs that can never be delivered fast nor perfect enough? This is not a card of bad news, as much as a signal of information arriving at an inconvenient time and delivered in an inelegant manner. Introduction: Unlike a number of the Swords cards, the Knight of Swords actually brings a fairly upbeat and cheerful energy. Knights can often mean that someone or something desirable is about to seek you out. The Knight of Swords also points to your physical, emotional, and spiritual energy being at a peak. General: If you’re waiting for news from someone or something, you are likely to like what you hear. 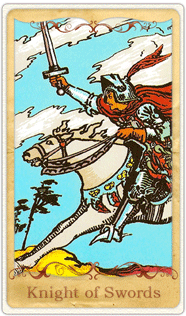 The Knight of Swords can point to lots of activity, travel, being out and about, getting things accomplished. You are unlikely to feel like waiting for anything to come to you; that’s a good thing… go after your heart’s desire. Work: In relation to work questions, this is a particularly good omen if you are looking for work. A job that is just what you’ve been hoping for may suddenly come your way. If you are already employed, things are about to get a lot busier, in a very positive way. You will be getting so much accomplished that you may make your peers look bad. That’s mostly their problem, but don’t be obnoxious about it. Love: You may literally be about to be swept off your feet, whether you are male or female. If you are currently in a committed relationship, It may be about to brighten up quite a bit and become a whole lot deeper and more satisfying. If you’re looking for love, it may come along when you least expect it but you have to be having some sort of contact with other people for the door to be open to this. Get dressed up and go out on the town. You’ll have a blast. Finances: With regard to money, the picture looks good when the Knight appears. You may receive some cash that you weren’t expecting. Don’t spend it all in one place. Your returns on investments are looking good. Keep doing what you’re doing. Share your wealth in whatever way you can. Health: The Knight of Swords points to relatively good news with regard to health, but you may be told to slow down a little. If so, do as you’re told. The Knight has an element of somewhat grandiose energy and behavior. Yet doing your own homework into what’s ailing you can be helpful. You can harness your own healing energy and power now. Spirituality: In the context of spiritual questions, the Knight points to a need for silence and space to deepen your understanding. It’s hard to increase your spirituality if you’re running around like a chicken with your head cut off. Remember one of the greatest affirmations ever offered to the world: Peace. Be still.